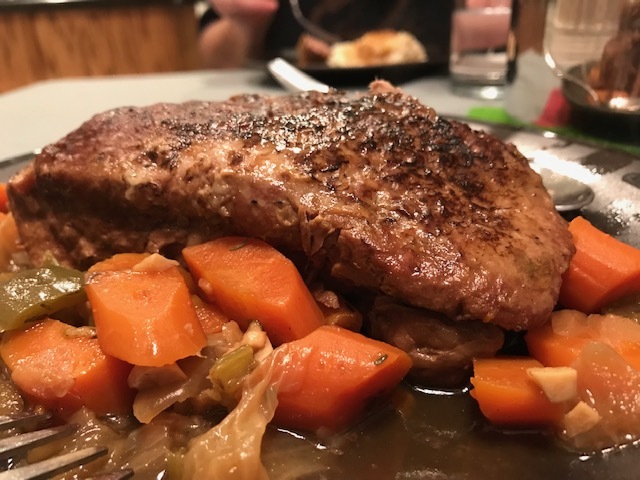 As there is only two of us, this recipe made one comfort food dinner and then another leftover dinner a couple days later. Perfect. If you have a larger family, the recipe is simple to double. Get a good piece of meat. Prime chuck roast is well worth the price. Watch so you can buy one on sale and keep it in the freezer until you are ready for some wonderful home cooking. Set the roast out about half an hour before you begin cooking. Do remember to put it in the microwave if you have cats that explore the counter. In the meantime, prep the rest of the ingredients. In a small bowl, combine the flour, pepper, and salt. Slice the onion, carrots, celery, and bell pepper, set in a bowl. Peel and mince the garlic, set aside. Combine beef stock with Worcestershire sauce, thyme, black pepper, and bay leaf. Press the seasoned flour all over the roast and set it on a plate next to the stove. When everything is ready, set a heavy 4 quart pot on a stove. Heat the pot over medium high heat. Add the oil, let it sit a bit until the oil shimmers. It will need to be quite hot, but not smoking. Brown the roast on both sides. Take your time here and let the roast sit in contact with the pot. You will begin to notice when the aroma changes from raw to browned meat. Check it and flip over once it is beautifully browned. Repeat on the other side and then remove to a plate. Reduce the heat to medium and add the onions, carrots, and celery, and cook stirring infrequently until browned. The veggies will add some juices to the pot. If you need to, add a tiny splash of more oil. Stir to keep things from smoking. You are not going for caramelizing or pre-cooking, just browned a bit. It will only take a few minutes. Reduce the heat to medium low and add the garlic, stirring constantly for 30 seconds. Pour in the seasoned stock, stirring well to deglaze the pan. Gently place the roast back inside the pot. Top with fresh thyme, if using. It adds a gentle aromatic to the meat and a lovely look at the end. But it is not required to end up with pot roast goodness. Once the liquid arrives to a simmer, turn the heat to low and cover the pot, braising for 3 hours – do not boil the meat. After about an hour and a half, baste the roast. Replace the lid. After three hours, remove roast to a platter and tent loosely with foil. Use a slotted spoon and remove largest pieces of veggies to the platter with the meat. Surround the beef with veggies! Recover with the foil. Leave smaller veggies in the pot. Skim the fat if needed (you should not need to) and remove the fresh thyme. 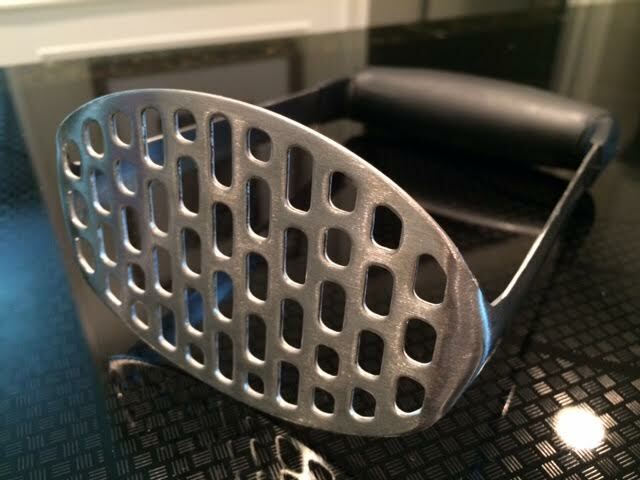 Using an old style potato smasher , mash the remaining veggies. They will help thicken the sauce. Raise the heat to medium and let it go, stir frequently until the sauce reduces. Taste and adjust for salt and pepper. Pour into a gravy bowl. Serve with the pot gravy. You may want to make mashed potatoes as an excuse to eat more of the gravy. This entry was posted in Beef, Main Dish, Small batch and tagged chuck roast, home cooking, savory. Bookmark the permalink.